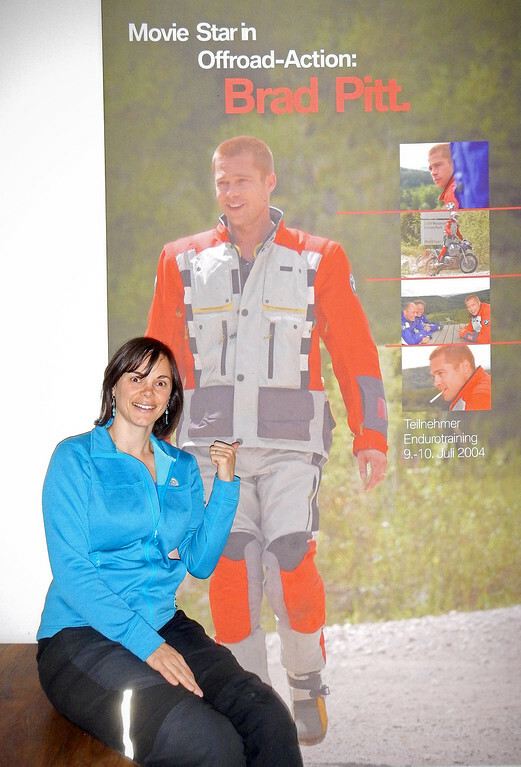 One of the inspirations for our trip is the documentary, Long Way Round. We watched it when it came out way back in 2004. 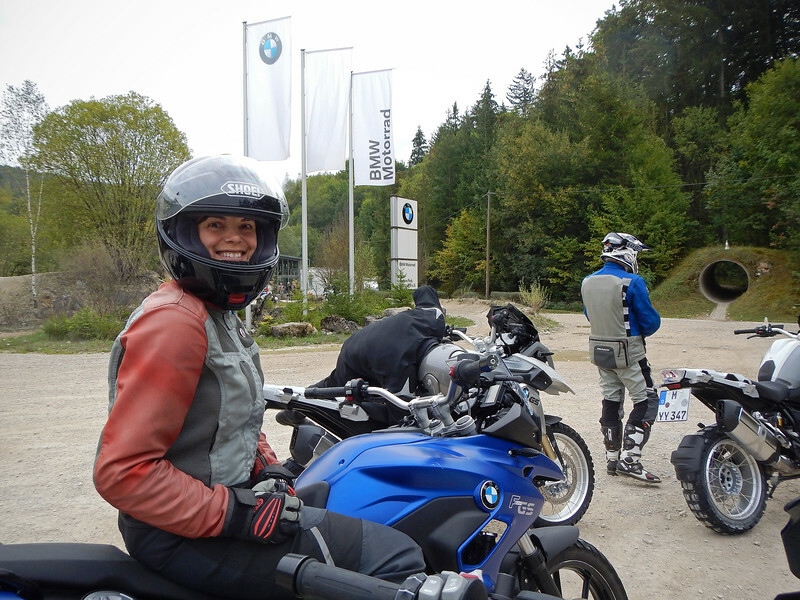 The moment Neda saw the boys training at the BMW Off-Road School with Simon Pavey, she's wanted to take the course herself ever since. I thought it was interesting, but personally, I would rather spend the money on a track day on one of the MotoGP circuits. However, when we stayed with Bettina last year in Switzerland, Neda found out that Bettina also wanted to take the training. 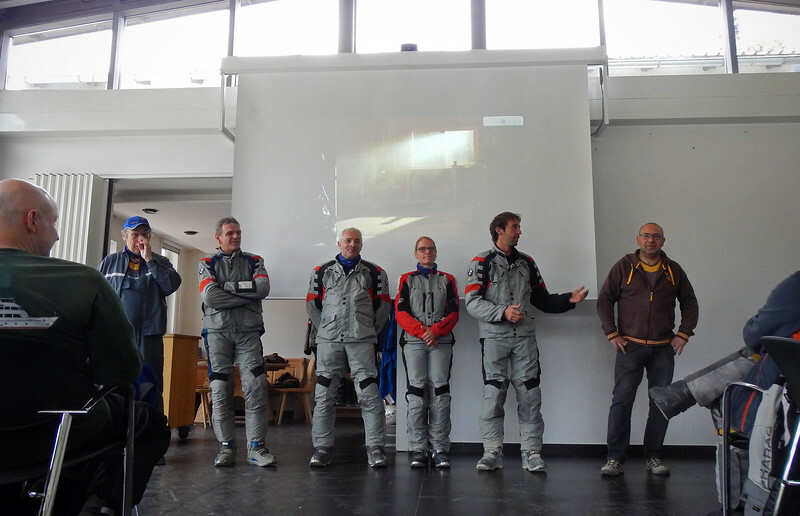 So together, they booked this course almost a whole year in advance and planned to rendezvous at the BMW Off-Road training in Hechlingen, Germany. In the meantime, I checked the prices for all-inclusive trackday packages (superbike + gear rental + track fee) at the European MotoGP circuits and they were waaaaay too expensive. So I decided to join the girls in the dirt as well. Neda's been looking forward to this for over 10 years now! 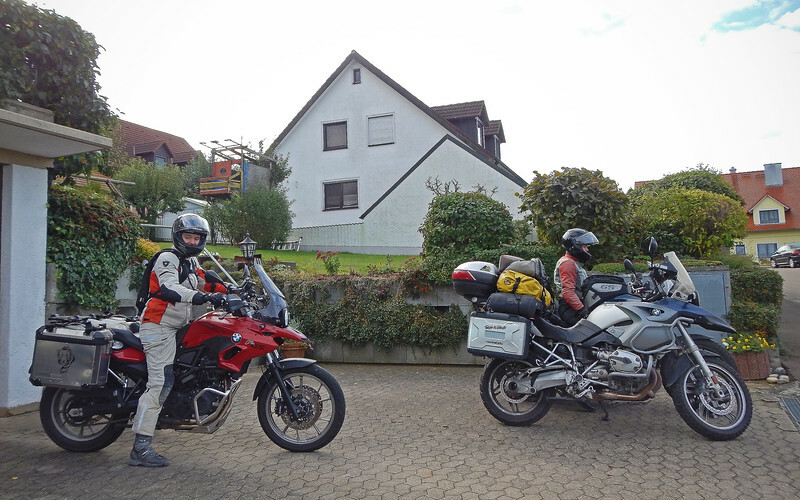 We're booked into a bed and breakfast in Hechlingen and we arrive a couple of days earlier. Hechlingen is tiny, other than houses the only feature here is a lone hotel. We hang out in the lobby and steal their free wifi because our B&B is wifi-less. Again with the lack of public wifi in rural Germany! The closest grocery store is a few minutes away in the nearby town of Heidenheim, so we do a bike run to stock up on food. The next evening, Bettina shows up and we have a joyful reunion. It's been almost a year since we last saw her and we spend hours at the kitchen table just catching up and getting all revved up for the weekend course! BMW Enduro Park! 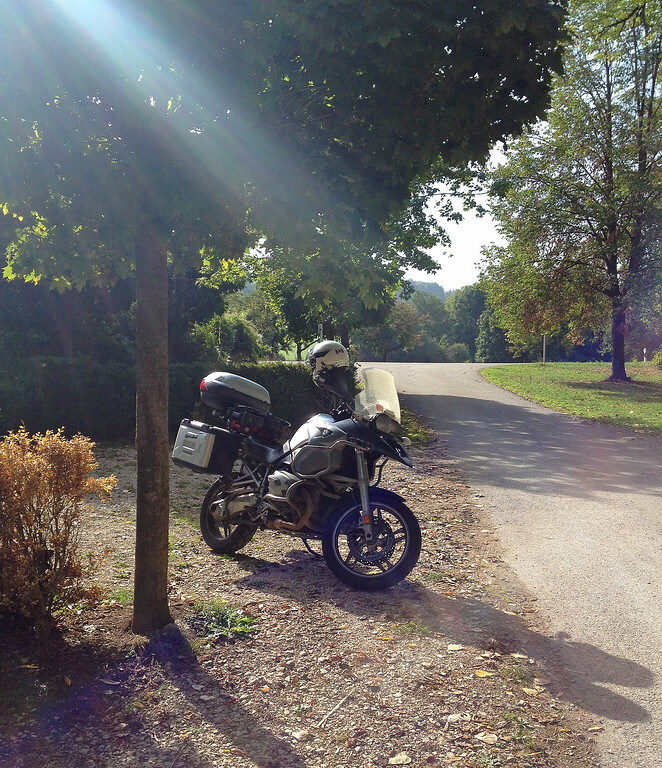 Heaven in EU for dual-sport motorcycles! 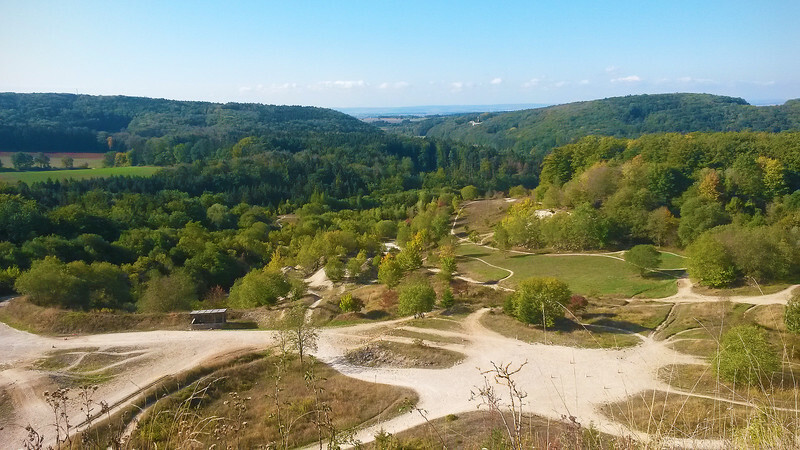 The BMW Enduro Park is 26 hectares of trails and training area. There are hills, bowls, ruts, whoops, obstacle courses, jumps and tricks, and tight single-track through forested and open terrain, over a variety of surfaces like hard pack gravel, small rocks, mud and sand. 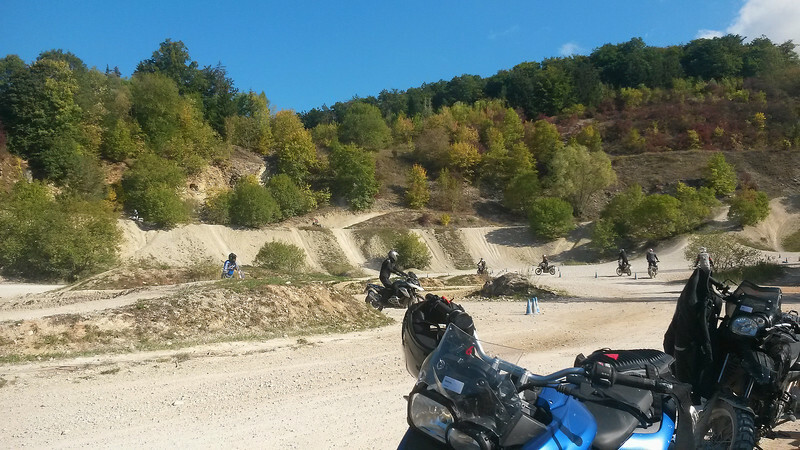 In the heavily-regulated European Union, it's unusual to have such a large playground for motorized vehicles (let alone only for two-wheelers), so riders from all over Europe come here to satisfy their off-road addiction. Folks in North America don't know how good they have it, with so much wide open space that can be dedicated to off-road motorsports. We get our gear inspected and everything passes muster except for our street boots. 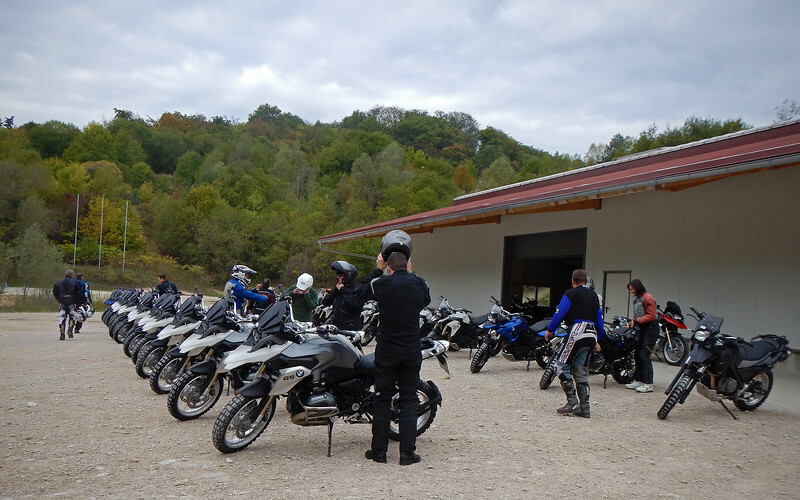 We are able to rent motocross boots at the lodge and then we get divided up into groups. There are three levels, Beginner, Intermediate and Advanced. Since Beginner group is for new riders (dirt or street), most of the students, Neda and Bettina included, slot themselves into Intermediate (street riders with little-to-no dirt experience). I sign up for the Advanced (some dirt experience). The instructors tell us that if it looks like we don't belong in a group they'll move us up or down after the first session, so I might as well challenge myself. Manuel used to be an ex-motocross racer, so I feel like I'm in good hands. 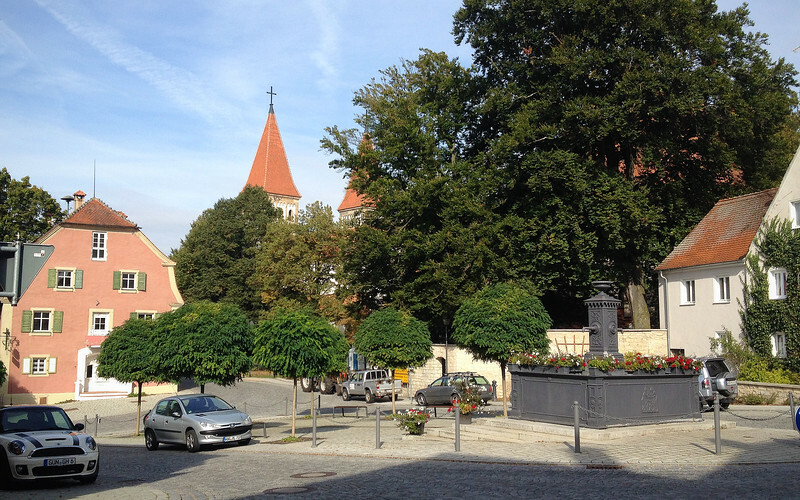 But all of the instructors have impeccable credentials and the course is offered in both German and English at the same time. 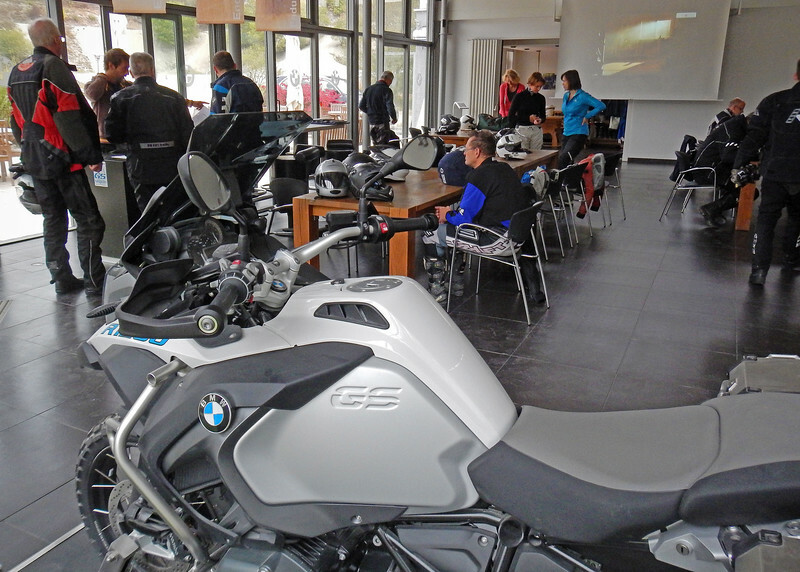 BMW Enduro Park offers several GS models, G650GS (single cylinder), F700GS, F800GS, R1200GS, and the R1200GS Adventure. 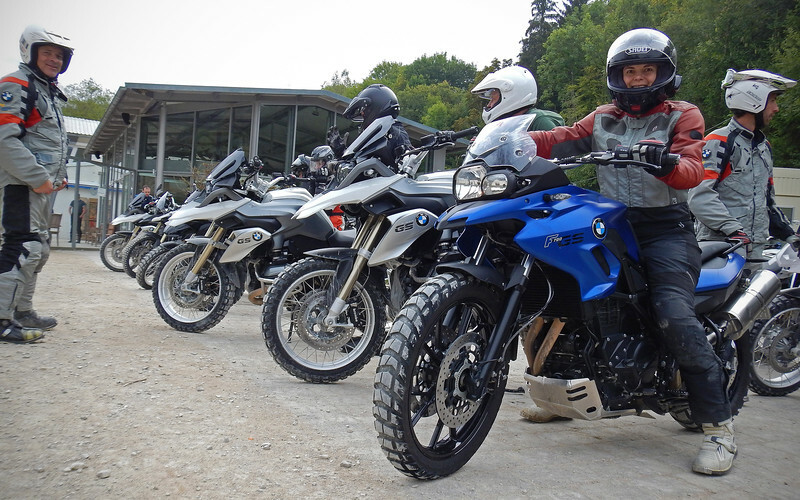 Most of the intermediates students choose the F700GS. 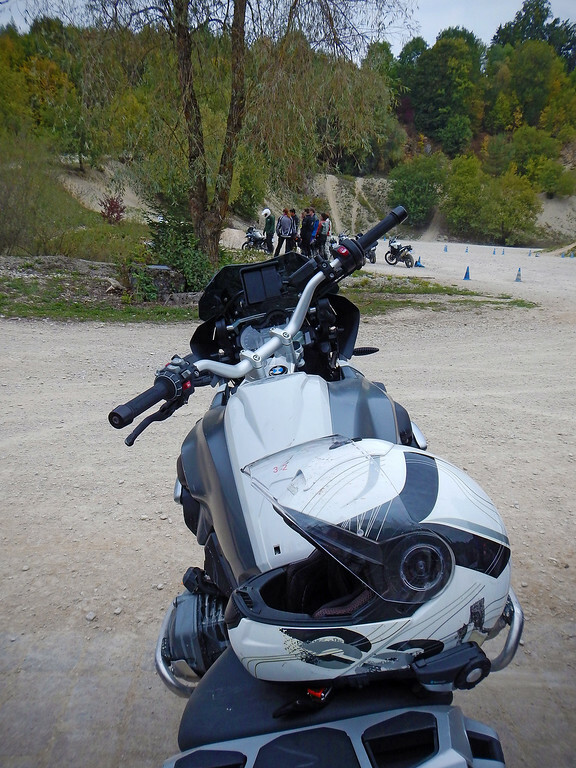 In the Advanced group, we have some experienced motocross guys, and they choose the F800GS. With it's bigger 21" front wheel and longer suspension travel, it's more suited for the course than the R12 Boxer. However, most of the Advanced guys do choose the heavier R1200GS because they're all tough guys and have something to prove. Actually, we're not all tough guys. Most of the students that opt for the R12GS already own one so they want to take the course on a bike that's familiar to them. Like me. I've been very curious about the new water-cooled model ever since it came out in 2013, this will be my very first time ever riding one. And it'll be off-road! What a great way to test it out! 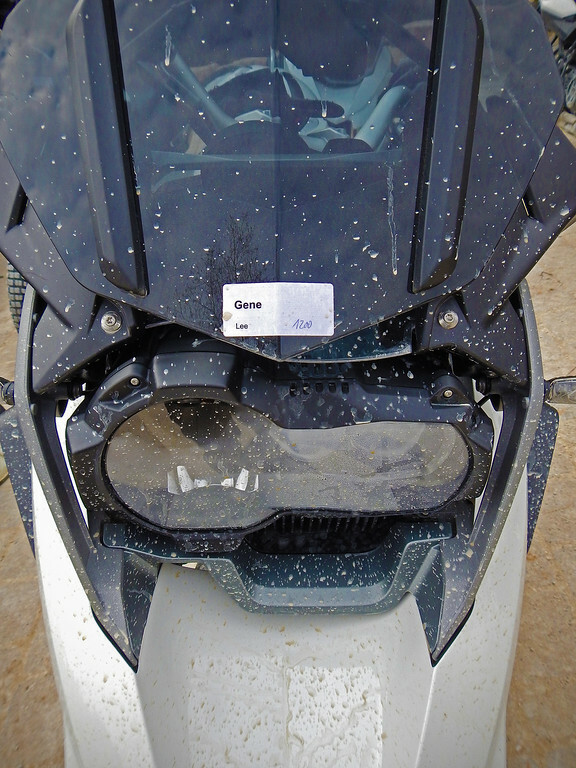 The R1200GS for the courses are pretty much stock. The only difference is the keyless & remoteless on/off switch, low windshield, crash bars and no mirrors. Also, bar risers raise the handlebars up about an inch or two, so it's a more comfortable reach when standing up on the pegs. All the bikes are current year models with very low mileage. 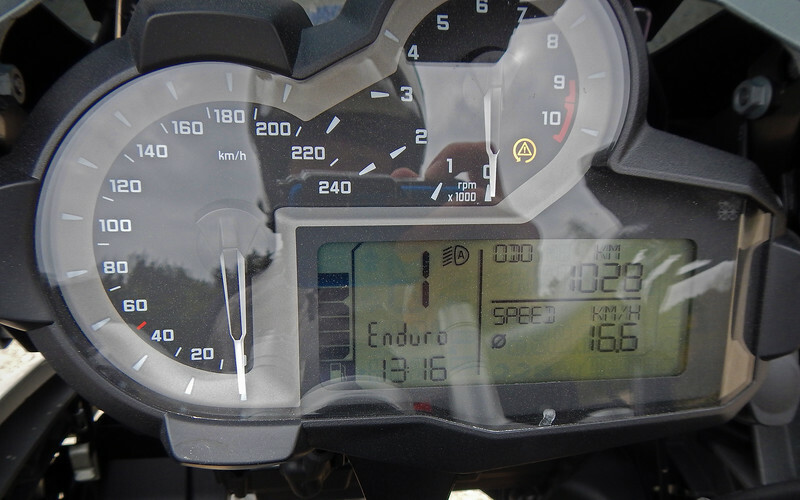 My bike only has 1000 kms on it! The tires are Metzeler Karoos, similar to the Heidenau K60s that we ran in Latin America. Neda's ready to hit the off-road! Each of the groups have a home-base where they get their lessons delivered and practice their drills. Neda and Bettina stay in the main training area near the lodge and Manuel leads us up the escarpment to another spot. The format is a short 10-minute lesson followed by drills and then a lot of free-riding in between. The first day we learn about body positioning, low speed drills, hill climbs and descents, front and rear braking, managing ruts and picking up a bike when it's down on a hill. And a lot of free-riding! Manuel and the motocross guys are doing jumps on their bikes. Geez. 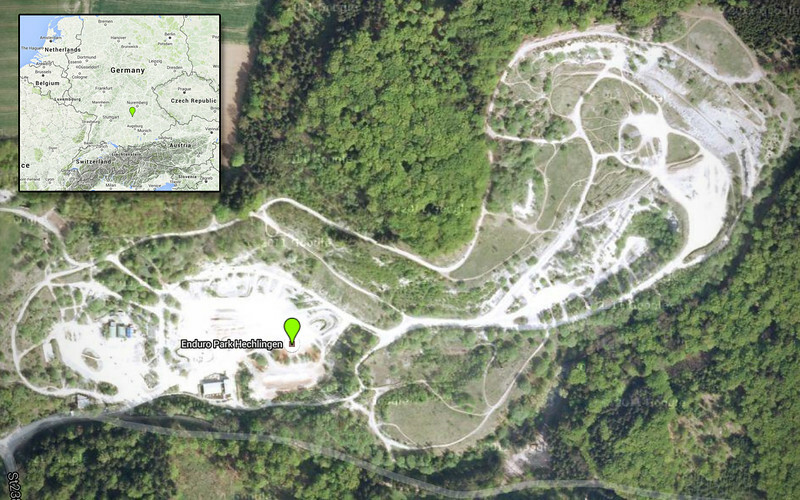 Watching those motorcross guys on the F800s, if I ever take the course again, I would rent that bike over the R1200GS. However, I'm amazed at how well I'm doing on the big pig. These bikes are well over 500lbs wet, twice what a normal dirtbike should weigh! Theoretically, they shouldn't be capable of doing some of the tight, gnarly stuff that Manuel takes us through. It's like being invited to go mountain-bike riding and showing up with a zamboni. 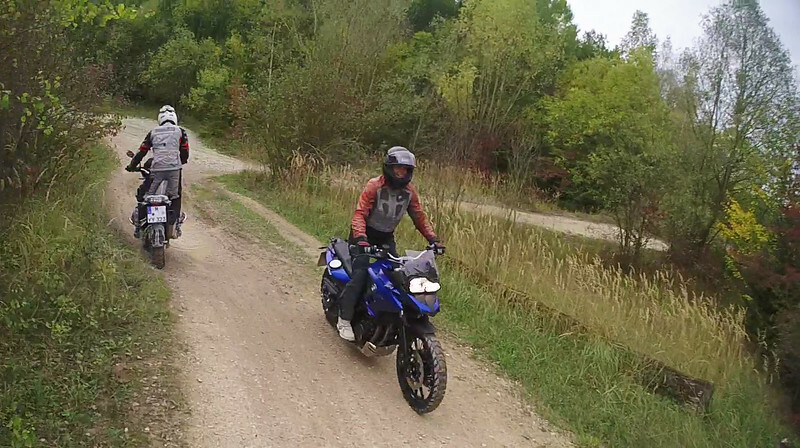 And then realizing once you're out on the trails that it's a magical BMW Motorrad Zamboni that's capable of wheelying and jumping over hills. Crazy! The only time I struggle is when the BMW Zamboni tips over and I have to heave it up myself from the dirt. There are a lot of tipovers and falls, I'm glad I'm not the only one. I'm also glad that I'm squarely mid-pack in the Advanced group, between the motocross guys and some of the less dirt-experienced street riders. When we head out onto the public roadways, we are advised to change the electronic suspension, traction control and throttle sensitivity settings from Enduro back to Street mode. However, I forget to change back from Street to Enduro after lunch and the bike is barely rideable back in the park, bouncing around all over the place. Since you can't change the setting while on the move and I was in the middle of the riding pack, to the guys behind me it must have looked like I forgot how to ride a motorcycle during lunch! 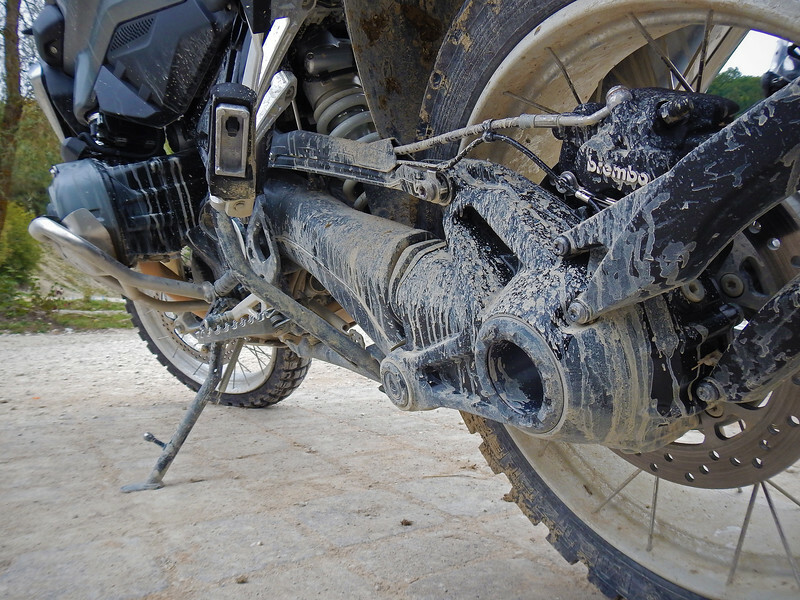 At the first break, I changed back to Enduro Mode and the BMW Zamboni was suddenly capable of trail-riding once again! That was a very good lesson on how important the suspension settings are. And also how easy it is to change with the electronics. But these bikes are so computerized that I don't really think they'd make good Round-The-World vehicles. An electronic breakdown will be impossible to fix by yourself or a traditional motorcycle mechanic. You'd need a BMW computer technician to replace the computer or sensor and that's no good for the kind of travel that we do. I was wiped by the end of the first day, I had to call it quits about an hour before the day was actually done. I've been sedentary for so long that I'm very out of shape. It's embarrassing. That evening, we all slept the sleep of the dead and headed back out the next morning for Day 2. 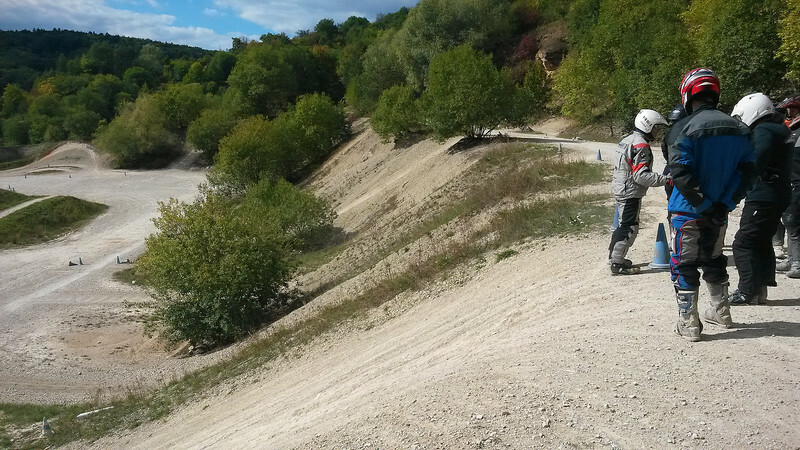 The curriculum for the second day was more advanced off-road concepts. Practicing front wheel slides and rear wheel slides, then using these techniques to quickly slide the bike around a slalom, advanced hill climbs and sand riding. When I talked to Neda at lunch, we found out that the Intermediate and Advanced groups have the exact same curriculum, just that the pace is faster in my group and there was more single-track free riding. Also the obstacle courses were more tighter. But you basically learn the same skills no matter what group you are in. Once in a while, I'll pass Neda's group. Every single time I see her, she has a huge grin on her face! This was soooo much fun. Neda said that it totally lived up to her expectations and Bettina has already booked another Enduro Park course later on this year! But enough with the boring pictures, here's some footage from my Sena Prism helmet-mounted cam. It took forever to put this video together because there were literally hours of footage I had to sort through!